More Friends and a Widening Process of Discovery! Yesterday my blog was about light, stained glass windows and memories. It was inspired by the visit to the Morse Museum and the Tiffany stained glass, but also by my interaction with the morning sunlight on my commute to the University. One of the aspects of my pilgrimage journey that I find so enjoyable is the process of discovery, whether it be searching for pilgrimage sites and discovering places like St. Leo’s Abby, or a Buddhist temple with numerous shrines. In addition I enjoy the opportunity to meet so many new people from diverse and different places all over the world. At times I will let myself wander among the faces of my widening friendship circle on Facebook, like I wander a flower garden or museum. I marvel at what I find around the corner, at my feet or hanging on the wall! On numerous occasions I have discovered stunning photographs and inspiring artwork by my Facebook friends. I see this as one of those gifts that life offers, like taking a walk and listening to beautiful bird songs or seeing an unexpectedly stunning blossom, or being blessed with a sudden insight. Today I wanted to share the artwork of one of my Facebook friends. Her name is Jill, she lives in the upstate of South Carolina and among her photos was a “collection” of her recent paintings. I have never met Jill, but I recognize in her paintings qualities of my own outlook on the world, I recognize the signs of a fellow traveler, a pilgrim on a spiritual journey of discovery. I found myself spending time simply taking in the colors and the contrast, and finding what was for me profound meaning with respect to life’s journey. In one of my earlier postings, (Dec. 2, 2009) I noted the symbolic significance of Bridges, Paths, and Portals. 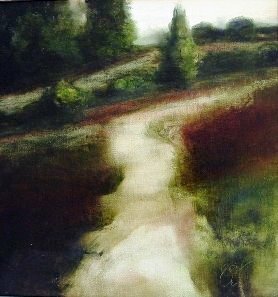 When I see Jill’s artwork I’m reminded again of analogy of life as a path. We walk down this path; sometimes we’re alone, sometimes with others. Sometimes the path is well trodden, like an interstate highway, at other times it’s barely a recognizable trail, like the deer paths I find in the woods on my hikes. As with any journey there are decision points or places where the path will fork and we have to decide do we turn right or left? Sometimes the path to the right maybe a steep upward climb, while to the left lays a fast downward track. Sometimes the path seems to widen, giving one space to roam, other times the path disappears around a bend or behind some trees. Roads or Rivers... Both are paths! When I study Jill’s artwork I think of these decisions. I also think of the fact, as was mentioned in my blog the other day, (Feb. 15 – Looking at Nature Makes You Nicer) that it’s best to stop and smell the roses when you have the opportunity. It’s best to be aware of nature’s gifts with every step, along the journey. The decisions, the forks in the road, will greet us but we shouldn’t worry about what’s around the next bend. As long as we’re prepared to respond, as long as we’re aware of our surroundings and ourselves, when we turn that corner we will face whatever is there. 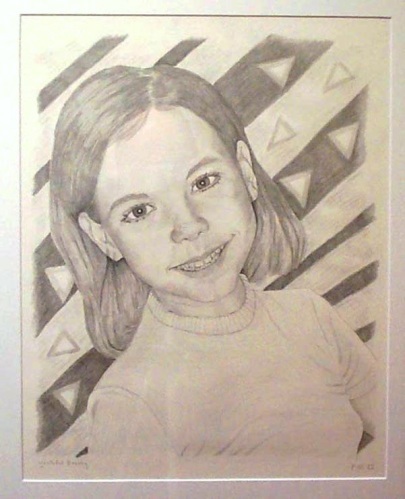 I am thankful for artwork like Jill’s I find it to be comforting and familiar. It captures the “feel good” qualities of nature at the same time it inspires the viewer to look a little closer at their surroundings, to be aware of what’s around us and to take in the big scene at times. Part of the process of life is finding a balance between looking down, so as to not trip over things, and looking up so we don’t miss the panoramic views. Life as a journey is not without its dangers (e.g., stumbling stones, potholes, mud on the path) but it is a path lined with a bountiful harvest of gifts (e.g., flowers, artwork, sunlight, and the smiles of friends). Look up… look down… and enjoy both views! How many gifts have you found and enjoyed today? Thank you Jill for letting me share your gifts with our widening circle and keep up the good work! I vote to follow the flowers around the bend! Art: Product or a Process of the Spiritual Journey? 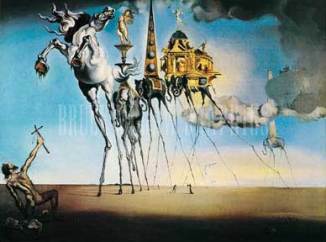 As I climb on the bike this morning I am I thinking about the pilgrimage site we will be visiting today; The Salvador Dali Museum in St. Petersburg Florida. It represents the first time we have visited what I call an Artistic Site. 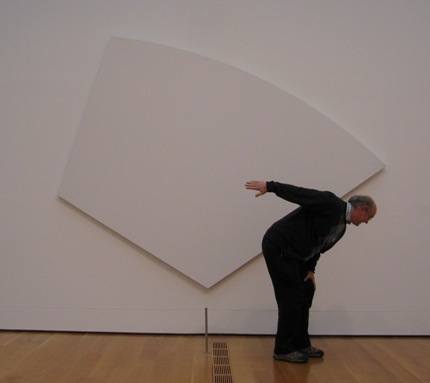 You might ask how artwork or an entire art museum can represent a spiritual destination. One way in which artwork might meet this distinction would be if the art in question was of a religious nature, such as an exhibition of medieval church art or African tribal masks. 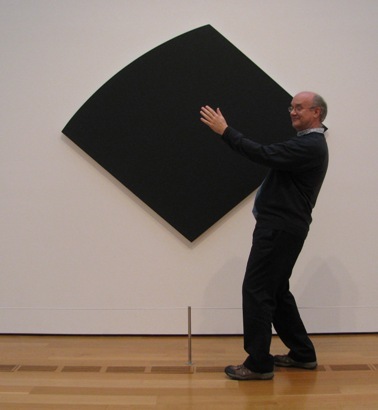 The second way is that the site might display artwork that represents an artist’s spiritual journey. It might highlight transitions or changes in the artist’s work as they grappled with spiritual questions. 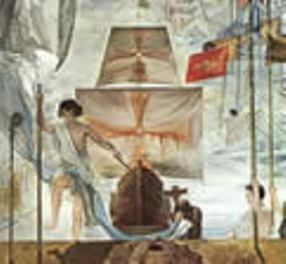 Dali: A work of Art! I was unable to find specific references to the reason for this transformation in his personal life, however, I suspect that he, like many artists and writers, struggled to “make sense” of the world after World War II. The devastation of Europe and the Holocaust had a profound effect on many people. Questions about the meaning of life lead some people to even question whether God existed or was in fact “dead.” Others return to their church roots and/or became fascinated with the proliferation of new scientific discoveries. One biographer noted that that Dali showed a particular interest in the area of nuclear physics, perhaps struck by the power of the atom and the nuclear bombs that fell upon Japan. His interest in science is evidenced by his painting honoring Crick and Watson, the founders of DNA. 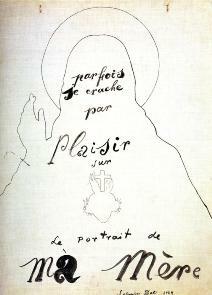 His shift to religious themes is evidenced by his paintings: “Temptations of St. Anthony,” or “Christ of Saint John of the Cross,” or the “Last Supper.” There was some evidence of religious conflict as seen in his drawing: “Sometimes I Spit for Pleasure on the Portrait of my Mother,” where he painted the words over an outline of the Christ of the Sacred Heart. Like many artists and writers I get questions from people about the creative process, where it comes from and what role it can play in our life. I see the creative process as a powerful spiritual process. Our creative efforts can be a representation of what we already believe, where our beliefs guide the process of choosing and creating symbols. At other times the process of discovery guides the unfolding artwork and the artist can be just as shocked and awed, as any viewer, at the symbolic outcome. I’ve had people look at my artwork and excitedly proclaim what they see; I often smile and thank them for their observation, because now I see more complexity and more meaning in the work myself. I suspect that Salvador Dali’s work falls into both of these categories. 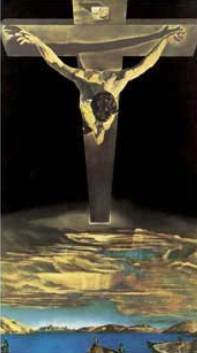 Some are likely reflections of his conversion to Catholicism, while others reflect his personal process of discovery and may act as a mirror for the viewer to conduct their own personal exploration. I suspect that really good art does both. You may see what you already know and feel comfortable with, or you may see new things that raise questions and open doors onto a new reality. The creative process, like any pilgrimage or journey, has the potential to inspire and clarify as well as the potential to raise disquieting questions and undermine our belief system. If all life is a journey, we have no choice but to live it, to continue our process of discovery! 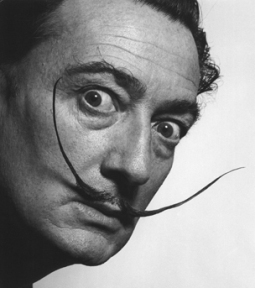 Please click on the pilgrimage site tab to find in webpage information concerning the Salvador Dali Museum webpage. Enjoying Art or Being Sacrilegious? I’m not riding my stationary bike as I dictate today’s posting. I will climb on it later. As I noted yesterday, some days I feel the need to walk. Today I felt the need to start a fire to burn off some of the dead branches and trees I thinned out over the summer. I’m walking in the woods along the river thinking about yesterday and my visit to the High Art Museum in Atlanta. I enjoyed the smorgasbord of artistic images. We started our visit in the European wing of the building. The show featured a number of Renaissance era paintings and as might be expected, most of them had religious themes. The Madonna and Christ child were popular topics. This got me thinking about the connection between art and spirituality. Art historians and anthropologists might argue that the two have always gone hand in hand. The prehistoric cave painting and objects found in early burial sites clearly had spiritual meaning and significance to members of ancient communities and cultures. These early artists were as much “craftsman” as they were what we would now call artists. Huston Smith in his book The World’s Religion, notes that in the early primal or earth based tradition such as the American Indians: “there is no word for art, because to Indians everything is art. Equally, everything is, in its way religious.” There was no distinction between secular and sacred objects. A cave painting, a weapon, a bowl or spoon; all had spiritual significance for there was no dualistic division of the spiritual world from the mundane world. When the world and its objects all contained the divine and were interconnected, there were no distinctions between object, function and creator. All were intertwined. Prior to the Renaissance in Western Europe, all art was tied to spiritual themes such as the old and new testaments or the ancient myths of Greek and Roman gods and goddesses. This was to be expected because the church was the primary consumer of art with its need for icons and symbolism to present beliefs and teachings to an uneducated mass of followers. The church, meaning the Catholic Church, dictated what was defined as art and what was defined as heresy. With the arrival of the rich mercantile and powerful aristocratic classes art work broke free of religious oversight and control. 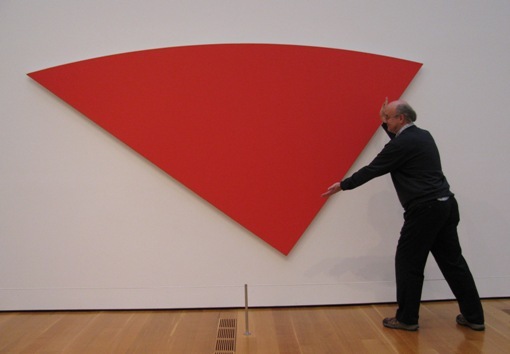 Art became eventually what we know it to be today, both functional art and art for “art’s sake” (i.e. the artist’s needs and desires). Turn on the TV or open a magazine and you will see functional art used for the purpose of commerce. Watch a political rally, like the recent tea bag events, and you will see art used as an emotional “call to arms” (e.g. Obama drawn with a Hitler mustache; or a cartoon of Mohammad as a mad bomber) to inflame emotions or steel a group’s resolve. Art has also come to serve an individual purpose for the artist and/or the viewer. It becomes a means for the artist to explore their beliefs and attitudes and to make a statement about their view of reality. 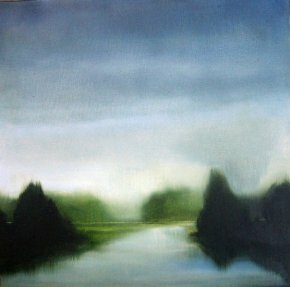 As such, it may convey a sense of connection if that is what the artist “knows,” or a sense of anger and disconnect, if that is what they are experiencing. One of the religious paintings I studied for some time, scribbling my thoughts into my pocket notebook was Nicholas Tournier: The Denial of Saint Peter, painted in 1630. The painting presents the story of Peter’s denial of his relationship to Christ. The size and lighting of the figures makes it an imposing and powerful image. I was struck at how this painting points to a simple fact of human nature. Understanding is always embedded in the current world view! 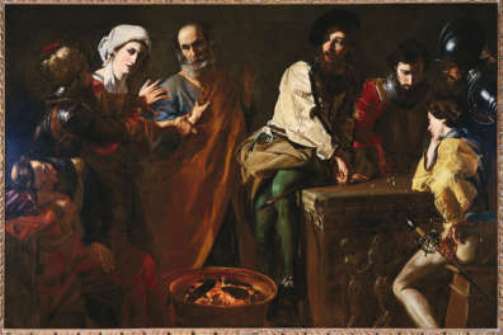 The painting is populated by Peter, a pair of accusers, and a group of disinterested Roman soldiers playing dice. I read the description twice to make sure they were noted as Roman soldiers. I smiled and shook my head because the soldiers bore no Roman style uniforms or weapons! Several wore armor that was common during the European middle ages. Obviously the artist used images and items that the viewers of his time could identify with! However, it was interesting to note that only the figure of Peter wears facial hair and a garment close to what might have been worn in Christ’s time. Why would the artist make it easy for the viewer to identify with the accusers and uninterested soldiers and not the Apostle Peter? I’m sure some religious historian would have a lot to say to that question. It ain't heavy its artwork! Why bring this up you might ask? Because what fits for artwork, it’s “rootedness” in a particular time and place, also fits for literature, even for sacred scriptures. Academic careers can be based on the study of the meaning of a particular symbol, word or phrase, especially if the words have gone through repeated translations or the symbol survives an illiterate “lost” culture. Some individuals and faith communities, recognizing this fact, have abandoned sacred scriptures and ancient myths. They embrace the revelations of the present, the mystical experience arising moment-to-moment. More traditional approaches embrace the words and symbol of the sacred stories and the idea that the meaning will be revealed through study and contemplation. 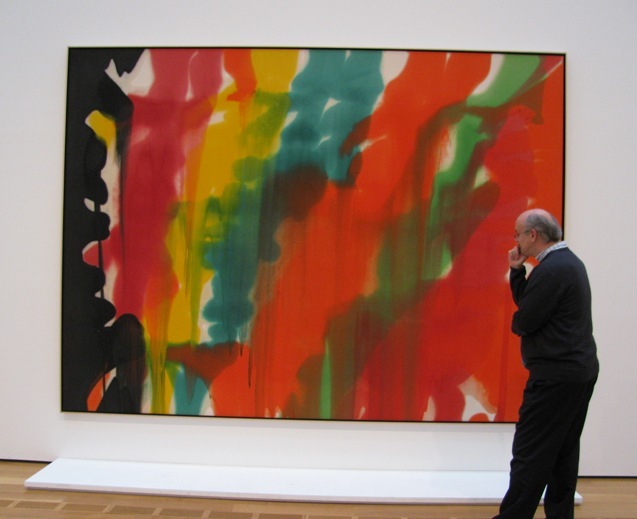 Both approaches have strengths and weaknesses and both use art in different ways. Who ordered the large slice? What did I enjoy most about my visit to the museum? 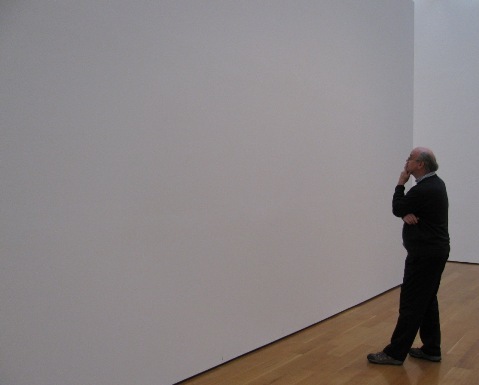 What I enjoyed most was interacting with the art! The images were thought provoking and I appreciated their beauty. I apologized to the museum guards who looked puzzled, and to the young art history major who looked askew at my irreverent actions and attitude. I took the art and made it a part of “the moment,” we had a relationship and became a larger work of art! My partner laughed and the art said nothing. I carried images of this interaction with me when I left, the images I now share with you. I didn't do it, nobody saw me, you can't prove anything! 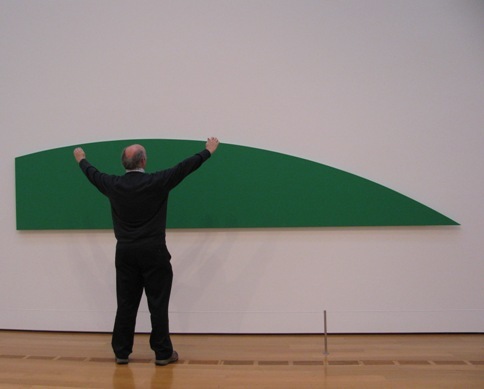 My suggestion to my readers: create art if you are so inclined. Appreciate and study art when you are given the opportunity. Find a way to have a relationship with art. For whether it is inspired by some celestial deity, or a product of some divine creative process which is God, it is always a gift! Do you ever have one of those mornings when you wake early and feel the need to take a walk to help clear you mind, still the swirl of voices, the struggle of feelings? I had one of those this morning. I got up, threw on my jacket and gloves and retrieved my Dictaphone from the car. As I walked up the street I found the swirling struggle of thoughts and feelings did not diminish! The Dictaphone would not record and produced only a loud whine. I pocketed it, deciding that perhaps I was meant to walk and just “be with” nature. While the stars twinkled overhead, a biting north wind chilled me to the bone. I chastised myself, as someone who had survived delivering papers in Dakota winters, the howling Alaskan winds and Antarctic storms, I could certainly put up with a chilly breeze. This idea of a walk, was just not working! I turned around, picked up my pace and a short time later I had returned to the warmth of my studio. As I ride the bike this morning I have no clear idea of what to blog about. Yesterday I spoke about the need to sometimes just “be” in the moment. I can do “just being” quite well when I’m surrounded by nature, standing in front of a fire, or walking in the woods. I have heard the call of nature as it is the source of much of my creativity (e.g. my nature poems, wall hangings, and artwork) and provides a calming and peaceful respite. It is a pull that can become so strong it leads people to becoming hermits and mountain men to retreat from human contact. I have heard the call and pull toward relationships with other people. I have found great joy and pride as a parent watching their child explore, grow and become their own person. I have felt the intense passion shared by lovers, felt the intense need to seek out friends for conversation during both moments of great joy and deep despair. I have felt the joy and satisfaction of guiding and mentoring others through “rough times.” I have also seen and felt the costs of relationships with others. I have experienced the heart wrenching pain of a parent watching a child “crash and burn.” I felt frustration as I watched friends and patients make poor choices that destroyed and damaged their lives, their health, and the lives of their loved ones. I have looked into pained and pleading eyes with little to offer. I have heard the call of the divine, experienced its presence in the world around me, in the people I meet and deep within my being. I have met people who live their faith in positive life affirming ways and act as models for the rest of us. I have met people who appear to have no relationship with the divine but find meaning in their possessions and accomplishments. I have known people whose relationship with the divine fed their sense of importance and self-righteousness but acted as a wedge between them and others. I truly believe for me, the best route is the middle way, a balance between the moment-to-moment gifts of nature and the sometimes joyful dance and often frustrating struggle with human relationships. I have come to realize that relationships should never be easy or at least not all the time. Good relationships (e.g. child, parent, teacher, lover, and friend) should challenge us to grow. Growth should be the underlying process, such that good parents should grow with their parenting, good teachers should grow with their teaching, good bloggers should grow with their blogging. As we approach the New Year, it is customary to take stock of the outgoing year, to congratulate ourselves for our accomplishments, and resolve to work on our short comings. It is a good time to think about growth! I will in the coming week steer my bike back onto our virtual path across Florida. I will be unveiling a “retooled” pilgrimage site page and map for my blog. I look forward to our continuing journey into 2010 and the growth it offers! The Taoist Walking Sticks are wall hangings I construct out of material and items I find on my nature hikes. 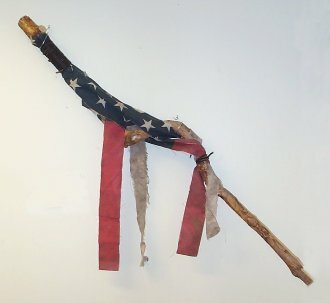 The examples shown included: stick, roots, feathers, deer bones, turtle bones and shell fragments, and remenants of a tattered flag. As I ride the bike this morning a number of topics swirl about in my mind. I have enjoyed our week in the Miami area. Next time I visit the area in person I’ll make a personal pilgrimage to the Holocaust site as I was struck by the images which still haunt me with their poignancy. I am looking forward to hitting the “open road” as we head west I hope to see more gorgeous nature scenes. One of my viewers asked the question, concerning yesterday’s postings, if meditating was so profound then why did I stop after seven years? There are probably several potential postings embedded within this question. Let me just give a brief answer for now. Any good habit such as exercise or diet can fall prey to changing circumstances. In addition, there is always the danger that we can become so complacent about the positive efforts that we forget the source of these effects. My life took on many challenges as I married, entered graduate school, moved about the country. My meditative practice suffered as I took on the roles of Professor, therapist, and father! However, the ability and knowledge is there, and at particularly stressful times I return to it to steady my nerves and calm my mind. Why have I not fully reimmersed myself in the meditative practice? In a way I have, but in a different way! In general there are two forms of meditation. Concentration meditation, the form recognized by most people, where the mediator sits quietly and turns inward using a mantra (sound) as a meditative device. The goal is to quiet your mind to the point of “no thoughts.” Transcendental Meditation is one such technique. The second form of meditation is called Mindful Meditation, and is practiced by several branches of Buddhism. It involves focusing on and being mindful of whatever one is doing at the moment. Mindfulness of walking, breathing, studying a flower, the breeze on one’s skin can all be part of a walk through a garden. It is found to promote deeper insights into how our minds work to “create” the world around us and how to control our attention and focus. As my artistic interests grew over the last twenty years, especially my poetry, I found myself naturally and effortlessly using this technique. I would state that I still meditate but in a different form. There were way too many. If I had a real bike and was really there! Enjoy your day and be mindful of your journey! As I mount the stationary bike today I am a bit sore and tired. Besides riding yesterday I also dug up several large ferns in the woods and transplanted them into the back yard next to the river. I then collected and burned some fallen branches. It felt good to get my hands into the rich soil, a physical connection with the earth. Ever since I was a young child I was always fascinated with fire. I enjoyed burning the trash as I got to watch the dancing flames consuming the material, leaving what seemed to be so little ash. I see this as recognition of the cycles of the natural world, whether it is by decomposition or fire, what was once living returns to the soil for reuse. "Road to Town" by Stationarypilgrim. Yesterday I spoke of doubts that were nagging at me. Working in the soil and tending the fire helped me put them into perspective. Another thing that can help us find balance between our doubts and the gifts that life delivers is music! 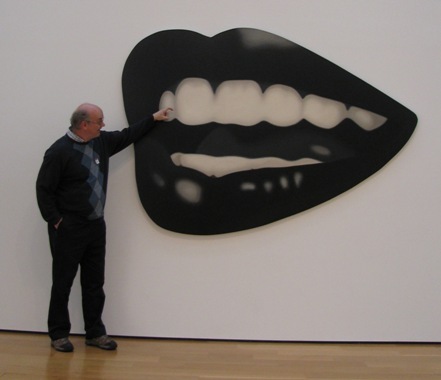 As I sat in the Doctor’s office on Friday (see yesterday’s Blog) with a growing concern for my partner’s health, the song by Miley Cyrus: It’s a Climb came over the radio. As I listened to the lyrics, I found myself lifted up and reminded that it’s not the mountain (ill health), an arbitrary timetable or finish line on the other side. The important thing is to make this climb, together and make it a source of deeper intimacy and strength. Choices and circumstances have brought us to this point, this mountain. We can not turn back. We’ve got to climb! Music like symbols can be a source of inspiration and lessons of wisdom. As I walked the woods digging up ferns I had to attend to obstacles like tangled brush and low hanging branches. I was reminded of a song by Ani Difranco entitled As is. The lyrics remind me of the need for a balanced process as we walk though life. We have to look up at times to see where we are going. If we get too absorbed in the litter at our feet we are likely to miss a turn, or bang our head on a low hanging branch. If we keep our head up focused on distance scenery, we will be thinking of what is to come. We will miss the beauty and treasures at our feet and risk getting tripped up by vines and fallen branches. The key to walking in the woods, in life, is a balanced glance up – glance down rhythm and to keep moving. If you need to focus on the ground at your feet for more then a moment, stop and do so! As seen in DiFranco’s lyrics, she expresses healthy attitudes of acceptance and humor. It’s amazing how quickly a song can lift our spirits, helping us to scale a mountain in a balanced manner. A couple of quick notes, I will soon be adding a video component to the Pilgrimage Site visits. In addition, I’ll be retooling the “look” of the Blog to better reflect the scenery. Watch for these changes.